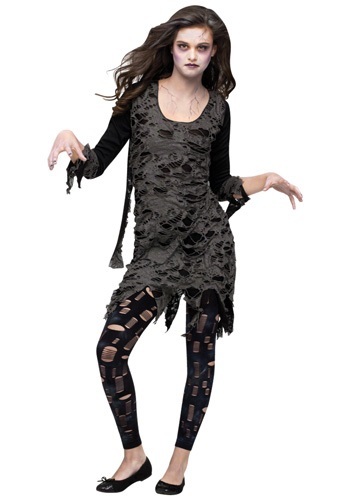 Become a scary teen zombie when you wear this teen living dead costume! The tattered dress is black underneath with gray tatters sewn on top. The sleeves and bottom of the dress are shredded. The leggings are black with charcoal gray patterns, and are shredded throughout. Be sure to add some of our zombie makeup to complete the scary outfit!